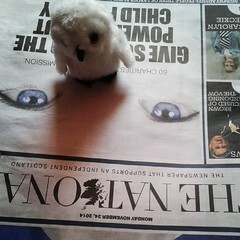 The kids' owl is reading The National, too by Thomas Widmann, on Flickr. It’s unlikely No would have won the referendum if almost all the media hadn’t decided to support a No vote — of all the newspapers, only the Sunday Herald supported a Yes. This is of course the reason why many independence campaigners are now looking at starting up new mainstream media ventures, such as the Scottish Evening News, Bella Caledonia’s expansion, and Common Weal’s Common Space. However, it’s also wonderful to see that commercial companies have noticed the gap in the market, which is of course why the Sunday Herald today launched its daily offshoot, The National. I would have preferred the Scottish media landscape to be dominated by newspapers without a strong stance on the independence question, but when the reality is that the majority of the existing ones are Unionist, it’s absolutely wonderful to welcome a pro-independence newspaper. It’s also a good read. I personally prefer somewhat more verbose ones with longer articles and smaller photos (and I hate it when newspapers use letter-spacing to achieve justified paragraphs! ), but it’s reasonably priced at 50p, and it has a good mix of stories. Hopefully they’ll soon change their minds — it would be a shame if these supermarkets decided only to welcome Unionist customers. I hope The National will have a great first week so that it becomes a permanent part of the Scottish media landscape. Once that happens, will it be long before the Sunday Herald rebrands itself as the Sunday National, I wonder? Alasdair Smith liked this on Facebook. Since the main supermarkets were obedient to the Better Together Project Fear call I have been trying to move my patronage elsewhere. This is just another black mark against them. Correct me if I am wrong, but doesn’t buying local affect the government economics statistics? More of it shows up in Scottish figures, and the profits stay here too, rather than going to London. A Sainsbury member of staff has said he was prevented from selling the National because the management objected to its pro-indy stance. Another reason, if one was needed, not to shop at Sainsbury’s.